The Northeast Extension Risk Management Education Center was established in 2001, and is located at the University of Delaware. It is funded through USDA’s National Institute of Food and Agriculture (NIFA), and is one of four regional ERME Centers located throughout the country. The Northeast Center serves the region which includes: Connecticut, Delaware, Maine, Maryland, Massachusetts, New Hampshire, New Jersey, New York, Pennsylvania, Rhode Island, Vermont, West Virginia and the District of Columbia. 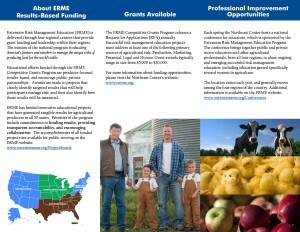 The Northeast Center, in conjunction with the other three regional Centers, conducts the Extension Risk Management Education Competitive Grants Program. This program involves an annual competitive process, and provides funding to both public and private sector organizations for educational projects designed to improve the ability of agricultural producers to effectively manage the complex risks associated with their agribusinesses. The projects supported by the program provide tools and training which enable producers to establish new risk management strategies that will strengthen the economic viability of their farm enterprises. 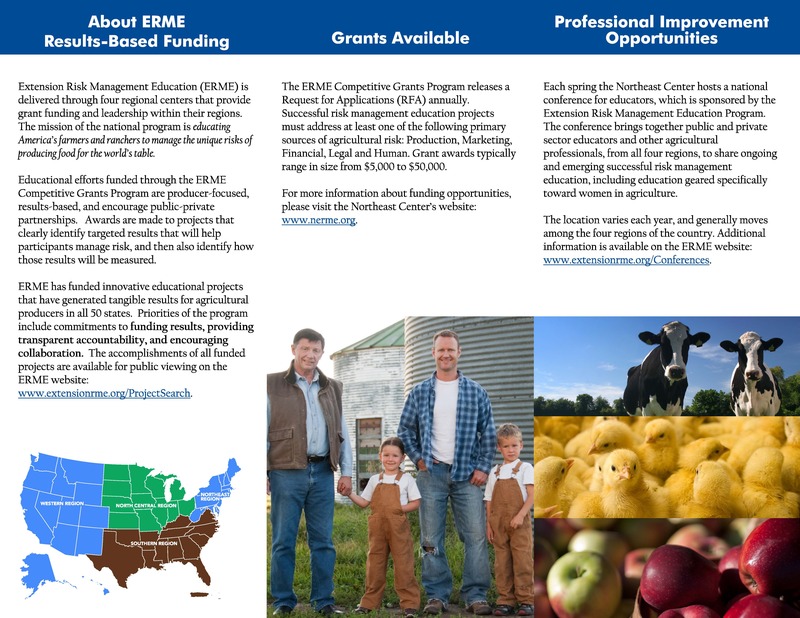 Extension Risk Management Education (ERME) is delivered through four regional centers that provide grant funding and leadership within their regions. The mission of the national program is educating America’s farmers and ranchers to manage the unique risks of producing food for the world’s table. Education efforts funded through the ERME Competitive Grants Program are producer-focused, results-based, and encourage public-private partnerships. Awards are made to projects that clearly identify targeted results that will help participants manage risk ,and then also identify how those results will be measured. The ERME Competitive Grants Program releases a Request for Applications (RFA) annually. Successful risk management education projects must address at least one of the following primary sources of agricultural risk: Production, Marketing, Financial, Legal and Human. Grant awards typically range in size from $5,000 to $50,000. 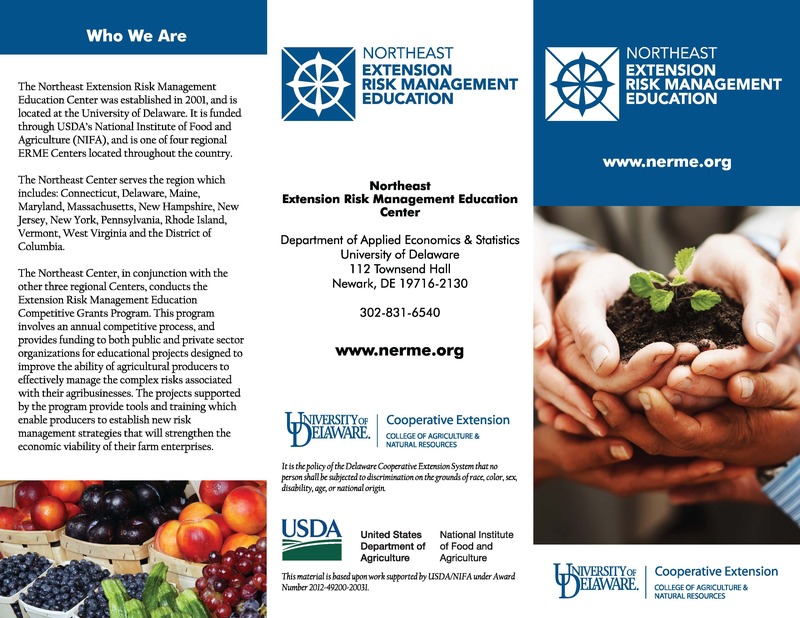 Each spring the Northeast Center hosts a national conference for educators, which is sponsored by the Extension Risk Management Education Program. The conference brings together public and private sector educators and other agricultural professionals, from all four regions, to share ongoing and emerging successful risk management education, including education geared specifically toward women in agriculture. 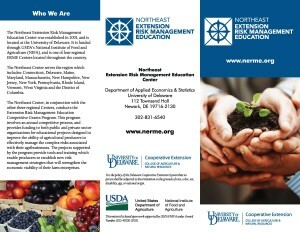 The Northeast Center’s Brochure – Click to view a larger image.